Decals for five subjects, with colour-printed painting and markings guide. Superb production quality and attractive subject choices. 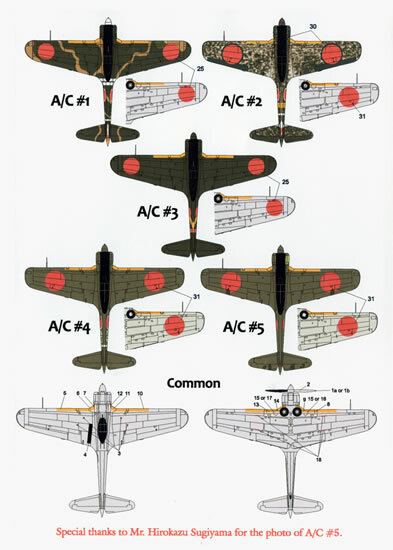 Lifelike Decals produce first-rate sheets with their ones covering Japanese subjects being the best around. This sheet is no exception. 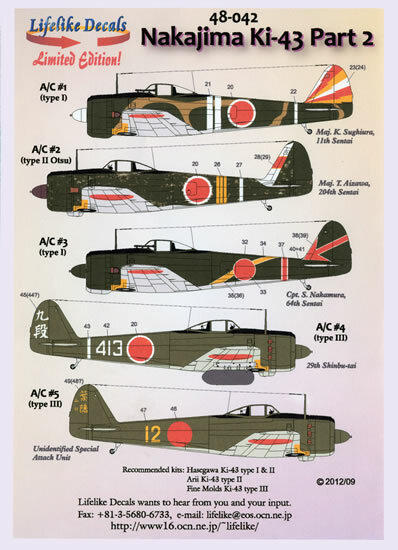 48-042 is the second of two new sheets from the Tokyo, Japan based producer Lifelike Decals for the Imperial Japanese’s Army Air Forces’ Nakajima Ki-43 Hayabusa (Peregrine Falcon), or Oscar as it was dubbed by the United States Army Air Force code name system. Type I of the 11th Sentai, flown by the Sentai Commander Major Katsugiura Sugiuraout of Mingaladon Air Base, Burma in October 1943. The notes on the placement guide advise that the machine’s colour scheme is somewhat controversial but advises you of all possible schemes with explanations for the conclusions. A very colourful bird indeed! Type II Otsu of the 204th Sentai (probably) flown by the Sentai Commander Major Torashiro Aizawa from Meiktila Air Base, Burma in the August of 1944. Colour scheme appears to be patchy green over natural metal finish. Type I flown by Captain Saburo Nakamura the acting leader of the 2nd Chutai, 64th Sentai out of Mingaladon Air Base, Burma in the November of 1942. Colour scheme appears to be dark green over natural metal undersides however; the notes on the placement guide advise that it could be brown rather than green. 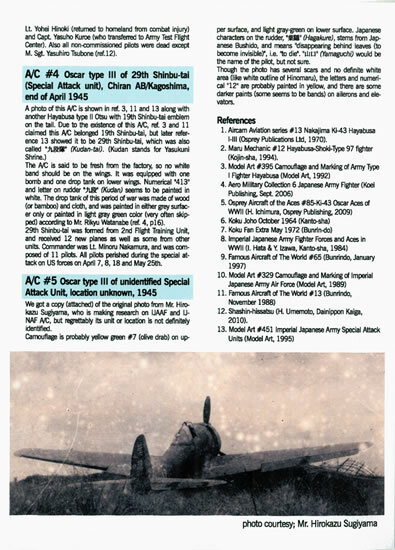 Type III of the 29th Shinbu-tai (Special Attack Unit) based at Chiran Air Base in the Kagoshima Prefecture at the end of April 1945. It is in “yellow green” over light grey green camouflage finish. Type III of an unidentified Special Attack Unit from 1945. No location is specified and the machine is in “yellow green” over grey-green camouflage finish. As with the first sheet, there is no indication as what company has printed the decals. However, they look first rate indeed. They are thin, have an absolute minimum of film surrounding each subject and are in perfect register. A smattering of stencil data is included on the sheets (there are two of them) including the thin propeller warning stripes. Also included is a set of yellow multi-part decals for the yellow leading edges of the wings, identification markings. 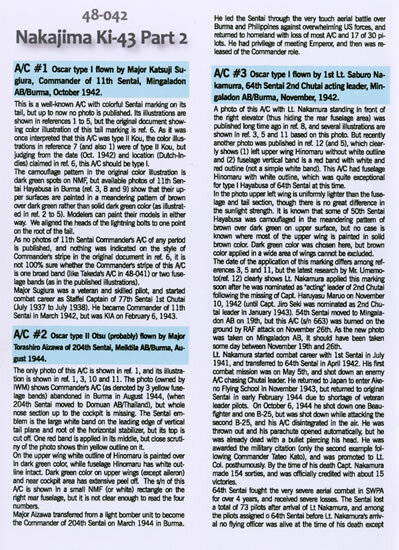 The recommended kits are the Hasegawa Ki-43 Type 1 and II ones as well as the ancient Arri/OtakiKi-43 II, and the Fine Moulds Ki-43 Type III. The placement guide comes in the form of two A-4 sized sheets. One sheet shows full colour left hand side profiles of the fuselage for each option as well as upper and lower plan views for each option. The other page has very comprehensive notes for each option which not only gives a potted history of the machine and the pilot but also a full explanation the colour scheme. It also lists 13 different references consulted in realizing the sheet. The decal sheets and the placement guide come packed in a clear plastic zip-loc bag. 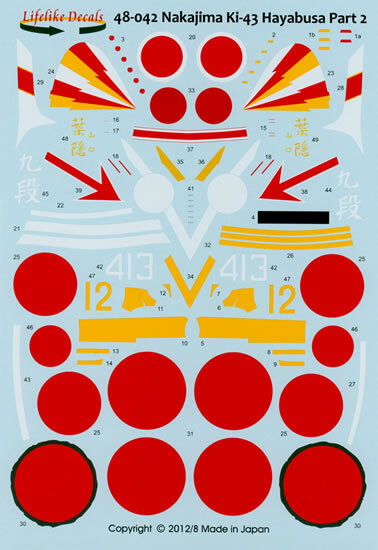 Lifelike Decals produce first-rate sheets with their ones covering Japanese subjects being the best around. This sheet is no exception. It combines superb decals with some outstanding research that will allow you to an accurate model of the depicted machine. Thanks to Lifelike Decals for these samples.